Chevy Chase’s real first name is Cornelius. Kansas City has more miles of boulevards than Paris and more fountains than any city except Rome. 96% of candles that are purchased are by women. Reykjavik, Iceland is the world’s most northerly capital city. Finland has 179,584 islands, the greatest number in the world. The pound sign (#) is called an anoctothorpe. In developing nations, 80% of diseases are water related. The slash character on a keyboard is called a virgule, or solidus. A Boeing 747’s wing span is longer than the Wright brother’s first flight. Swedish confectionery salesman Roland Ohisson was buried in a coffin made entirely of chocolate. The largest pearl in the world, the 14 lb., 1 oz. Pearl of Lao-tze was found at Palawan, Philippines on May 7, 1934. There are 41,806 different spoken languages in the world today. In 1963, baseball pitcher Gaylord Perry remarked, “They’ll put a man on the moon before I hit a home run.” On July 20, 1969, a few hours after Neil Armstrong set foot on the moon, Gaylord Perry hit his first, and only, home run. Between 1937 and 1945 Heinz produced a version of Alphabetic Spaghetti especially for the German market that consisted solely of little pasta swastikas. One of the best Snowshoe Snooki parodies I’ve seen, imagining how Palin would survive a total media blackout of her antics and ramblings. A great piece. A song through the eyes of an unemployed man in these tough times. Well sung with some wonderful guitar work, but it’s all about the words and the feeling that they evoke in these days of too-high unemployment and too-low expectations. Abraham Lincoln is the only U.S. president who was also a licensed bartender. He was co-owner of Berry and Lincoln, a saloon in Springfield, Illinois. Thomas Jefferson and John Adams once traveled to Stratford-upon-Avon to visit Shakespeare’s birthplace. While there, they took a knife to one of Shakespeare’s chairs so they could take home some wood chips as souvenirs. James Madison and Thomas Jefferson were once arrested together for taking a carriage ride in the countryside of Vermont on a Sunday, which violated the laws of that state. Martin Van Buren was the first to be born a United States citizen. All previous presidents were born British subjects. Thomas Jefferson wrote “The Life and Morals of Jesus of Nazareth,” which was discovered after his death by his daughter. It argues that Jesus was a great thinker, but that he was devoid of supernatural qualities that have been used to make him the center of Christianity. Gerald Ford worked as a model during college. He also worked as a forest ranger at Yellowstone National Park directing traffic and feeding the bears. George Washington’s original ancestral name was de Wessyngton, from a certain William de Hertburn, a twelfth-century noble knight of the manor and resident of the village of Wessyngton who later changed his name to de Wessyngton (which is the Norman spelling of Washington). Once upon a time Wisconsin was the epicenter of Progressive thinking, Republicans weren’t all right wing idealogues. Then in 1946 they elected Joseph McCarthy. 64 years later they elected Scott Walker. As your typical ideologically tone-deaf, uncaring and power-hungry Republicans, there really isn’t much difference between the tactics of Walker and McCarthy. On the other hand, the most famous Wisconsin Republican, Robert LaFollette, was not your typical Republican. In fact today, Robert LaFollette would be purged from the party so fast it would make even Rush Limbaugh’s head spin with something other drug-addled vertigo. Robert LaFollette of Wisconsin served as a member of the US House of Representatives, Governor and Senator from his home state. LaFollettee was originally a Republican who later helped found the Progressive Party. While in the US House from 1884 to 1890, as a Republican, LaFollette was a champion of Native-American and African-American rights. After a defeat for a 4th term in 1890, LaFollette returned to private law practice. It was then that the future Governor saw that the Republican party was becoming a virtual arm of corporate, especially railroad, interests. He was determined to reform the party from inside, something that couldn’t even be attempted in today’s corporatocracy. After the nation suffered a severe economic downturn in 1893, LaFollette’s insurgency within the party began to gain steam. He went on the campaign trail denouncing the power of big business and advocating for direct elections (many nominees in the party were not elected by direct electoral primaries). As a ploy, LaFollette would read the names of Republicans who opposed his populist programs to the people while on the campaign trail. More and more this tactic attracted national attention. In 1904, US Senators were ‘elected’ by the state legislatures. The 17th amendment eliminated that law in 1913. In 1905, the state Senate ‘elected’ LaFollette as US Senator, and he took office in 1906. Using a page from his Governor days, LaFollette would go on national speaking tours, reading the names of Senators who voted against the interest of the people. LaFollette was strongly against entering World War I in 1917. He felt that the country was tricked into the global conflict with lies and deception. He filibustered a key bill authorizing merchant ships to be armed. LaFollette was strongly condemned by President Wilson and the media began to denounce him regularly. 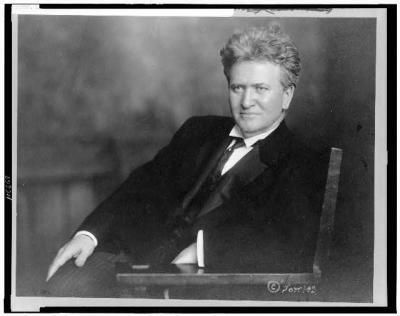 Some fellow Senators labeled his anti-war stance as “Pro-German.” But LaFollette never swayed. He opposed the draft, the Espionage Act and financing the war. After the AP completely misquoted LaFollette at a speech in Minnesota about the sinking of the Lusitania, which was used a symbol for the US to enter the war, the denunciation in the press began to label him a treasonous. To address the growing call for his ouster, LaFollette asked the Senate to permit him to speak and defend his position. In 1924, LaFollette formed an independent Progressive party and was nominated for President. His running mate was Democrat Burton Wheeler of Montana. His platform included turning the railroads over to the government, pro-union policies, protection of civil liberties, the end of all child labor, and a national referendum before declaring war. LaFollette got 17% of the popular vote and won the state of Wisconsin. It was the third highest 3rd party tally in American electoral history. It was the only Presidential election for which the Progressives put up a candidate. LaFollette died a year later in 1925. LaFollette’s sons both entered politics, Philip, as Governor, and Bob Jr., as Senator. In 1946, Bob LaFollette Jr., returned to the Republican party and was defeated in the GOP primary by Joseph McCarthy. As much as LaFollette was a man for the people, McCarthy was a man for McCarthy and certainly one of the worst members ever elected to the US Senate. As a note, Joseph McCarthy is a personal hero to Ann Coulter. That speaks volumes about Coulter and the right. In 1982, historians ranked the 10 greatest Senators in history. Bob LaFollette ranked #1, tied with Henry Clay. Joseph McCarthy did not make the list. I will bet that NONE of the current crop of GOP Senators of today will either. Thankfully I finally was able to get back to my blog. WordPress had not been working for me for almost three days, so that explains my lack of posts during that time. What the problem was and how long it’ll keep working now, I do not know, but I’m glad to be able to access it once more. Maybe a lot of readers were glad for the peace and quiet of me being gone, but alas, I’m back and ready to blog. This song is from his 1989 debut album of the same name. Multiple award winning singer/songwriter, son of novelist Larry McMurtry, writes each song as if it’s a novel told in the span of four or five minutes and set to music. One of my favorite artists for a lot of reasons.